Why Do Writers Write? 5 Reasons Why I Write. As a writer I’m often asked why, when the prospect of making any money through writing is a long shot at best, do I continue to write? I suppose the best answer I’ve come up with is, because I have to. What does that really mean though? Of course, I’m not going to die if I never pen another sentence. So, I guess the answer is more that I write because I’m compelled to write. Whether it be a story, or more specifically, a point I absolutely have to get across, it becomes my mission to communicate said story/point to another person. The time I spend in front of my keyboard is time I use to construct an argument or thought. Although some might suggest my snappy, sarcastic wit demonstrates quickness on my feet, I fear my talent is often limited to sarcastic, snappy jabs and not always to well thought out opinions. Writing makes me sound smart. Akin to the frustration you feel after leaving a discussion (most often a heated discussion) and thinking of all the brilliant things you could have said, writing gives me the Do Over moments where I can formulate brilliant thoughts in the comfort of my own space and at my leisure. As an added benefit, once I’ve written my thought down, they seem easier to access when standing in one of those party circles I dread so desperately – leaving me to sound as smart as I think I am. I write because I like being alone. I need me time, alone time every day. When I close the door to my office and press the power button on my computer, I’m alone. Although I LOVE to talk, I don’t always like being around a lot of people. Writing suits me down to my shiny red slippers. I love creating and sharing the people and place that live in my head. While in elementary school, I had a long walk to and from school. Maybe not your six miles in bare feet kind of trip, but still super far for a little kid. (Google map says we lived 1.4 kms from the school. How can that be? It seemed much further than that.) Of course, we’re talking about the days when parents didn’t drive kids to school. On really, really bad – I’m talking snowstorm from hell kind of days, we might each get 10¢ for the bus, but never, ever in ten years of elementary school, five years of high school, and three years of college, an actually drive door-to-door. But don’t worry Mom, I’m not bitter about all those trips since I used them to create imaginary worlds with imaginary people that were way cooler than the actual world I did live in. Often times, when I FINALLY arrived home, I disappeared into my room and wrote down the stories I had just imagined in my mind. I suppose that’s why I still love walking, because with each step, I continue to slip into my parallel universe. I love the control. Writing is about crafting sentences and paragraphs that I can move and manipulate anyway I please. Seeing a mish-mash of words and lining them up to form stories and arguments thrills me. I’m queen of my own word kingdom and I get a charge out of ordering my words around. But…at the end of the day, it seems science knows better than me, why I write. Scientists have shown that high levels of the brain chemical dopamine, paired with low levels of serotonin are strongly associated with creative thinking. To put it in layman’s terms, writing (for me) feels good. Writing excites me, not in the same way George Clooney does, but pretty damn close. Even when the writing isn’t going as well as it could, I’m happy, so don’t even talk to me about the charge I get when my writing is flowing. 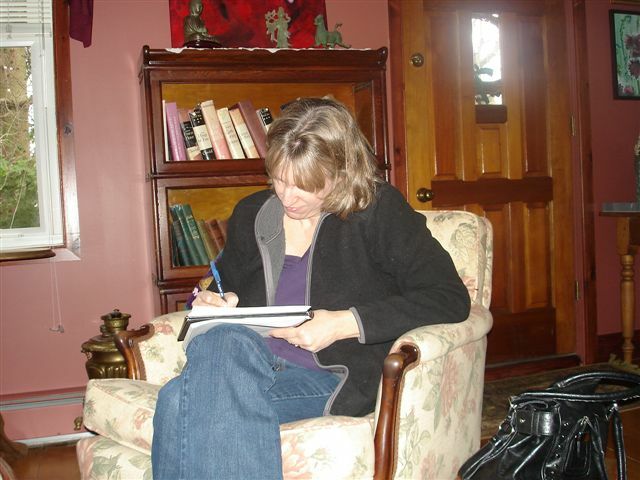 And as everyone at Casa Overend knows – if Mama ain’t writing, Mama ain’t happy! Aside from the dopamine, why do you write? Like you, I love that feeling of having hindsight at my fingertips. As well, it softens some of my more knee-jerk reactions. I love having a character come to life and the rich tapestry of emotion that writing affords me. Sounds to me, Dale, like you might just be a writer! Keep up the great work. I write for all of those reasons, but especially number 4. When I was in high school, I wanted to be an actor, but I’ve come to realize that writing is like acting for control freaks. Not only do you get to play all the parts, you’re also the director, producer and set dresser. Plus, you decide what everyone says, what they’re thinking and you choreograph all the blocking. Doesn’t get much better than that. Kind of like being a parent, but with children who use their listening ears and love been told what to do.